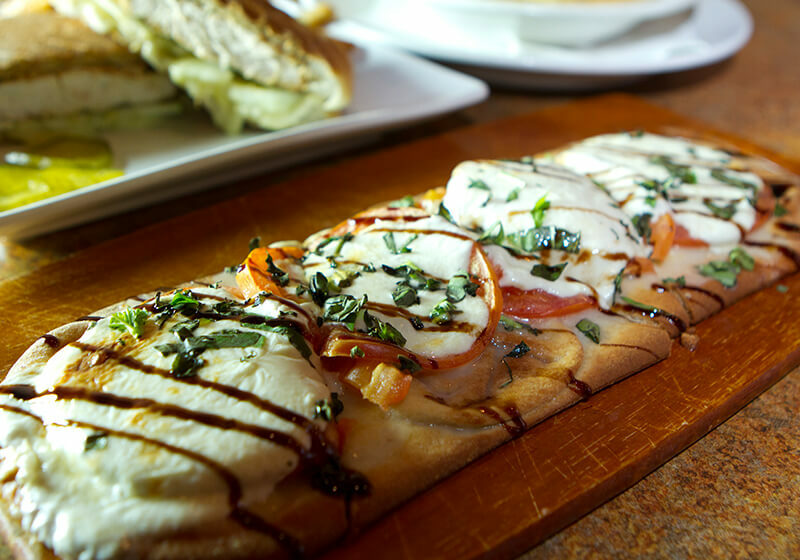 Honorable Mention: The Caprese Flatbread. Topped with fresh mozzarella cheese, sliced tomatoes, and drizzled with balsamic glaze. When you think of Old Bay, you likely picture the crab shacks dotting the Chesapeake Bay. It’s inherently Marylandian. Fortunately, you don’t have to travel to the shore to get the familiar flavor you love. Because at Garry’s, we offer the Round Bay Flatbread for lunch. This delightful dish combines super lump crab meat, crab dip, cheddar cheese and diced tomatoes on a flatbread. For good measure, it’s finished with a dusting of Old Bay. Go south of the border without leaving Severna Park. Just order the Grande Taco Salad. Choose from three-bean vegetarian or beef chili and add on chicken if you’re feeling fancy. The salad is layered with tricolor tortillas, tomatoes, cheddar cheese, romaine, sour cream, and guacamole – we promise, the guac isn’t extra. You’ll also get a fresh-baked mini-pumpkin muffin just because. You don’t settle for anything less than the best. And we hear you. But, sometimes, eating an entire eight-ounce filet mignon for lunch isn’t ideal. Luckily, you don’t have to loosen your belt for the rest of the day to enjoy a juicy cut of beef. For lunch, we recommend our St. John’s Sliders. You’ll get two 2-ounce filet mignon medallions, caramelized onions, and American cheese served atop toasted mini brioche rolls. Even more, there’s boom boom sauce on the side for a savory addition. Jump on the avocado bandwagon with our Turkey Avocado Grilled Panini. Nestled between two pieces of bread are thinly sliced turkey breast, roasted red peppers, baby spinach, tomatoes, and provolone cheese. Oh, and avocado of course. It’s light. It’s fresh. And, it’s the perfect entrée for lunch. The golden brown, flaky crust of the Chicken Pot Pie tastes just as good as what’s inside. This is new and oh so delicious. 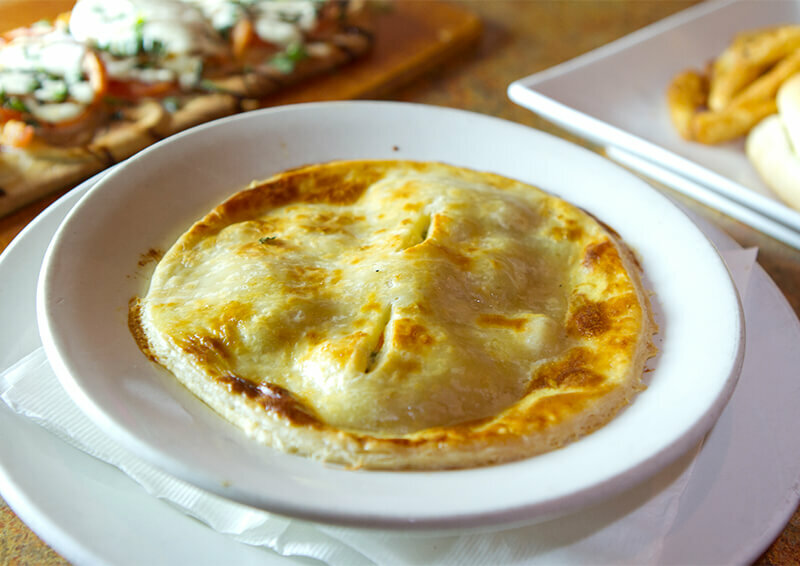 If you’re looking for comfort food, our Chicken Pot Pie is a must-have. All in all, marinated chicken, potatoes, corn, carrots, green beans, and peas go into the making of this savory dish. Did we mention there’s a rich, creamy gravy and a house-made buttermilk biscuit calling your name too? Whether you’re a man or an individual with a man-sized hunger, fill up on this sandwich. It’s got applewood smoked bacon, gorgonzola cheese, caramelized onions, sautéed mushrooms, jalapeños, lettuce, and tomato. Also, on the side, A1 sauce and Dijon mustard await. Overall, the Man Burger is just one of the lunch items on our local favorites list. Take a culinary journey to Western New York with our Buffalo Chicken Wrap. Buffalo-style chicken tenders mingle with lettuce and tomato inside a tomato tortilla. We even provide house-made bleu cheese dressing for authenticity. Just remember: you’ll probably want an extra glass of water before you dive in. You have seven chances a week to eat at Garry’s. That’s because we’re open for breakfast, lunch, and dinner from Monday to Sunday. Check out the full lunch menu for even more delicious options. Then, come visit us at 553 Baltimore Annapolis Blvd in Severna Park, MD to get your fill.